To be truly effective, your commercial refrigeration solution must offer reliable cooling control, energy efficiency and the scale your operations need. With 50 years of refrigeration knowhow, we’re ready to meet your most demanding applications. From small cold rooms to large-scale food manufacturing, Bradley Refrigeration can provide your complete commercial system – anywhere in the UK. Commercial refrigeration includes many applications, and we can provide bespoke systems for almost all of them. Our turnkey solutions can include design, delivery, installation and maintenance. 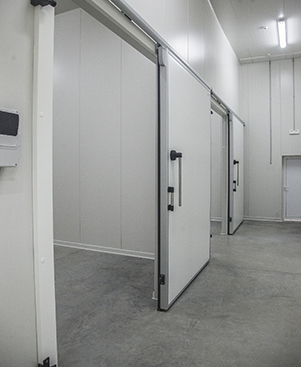 For catering and food production, we can custom-design refrigeration systems that meet your short-term or long-term food storage needs. Superb reliability reduces risk of food spoilage. Leading energy efficiency reduces your costs. For all kinds of specialised commercial refrigeration, our expert designers can develop the ideal solution. We can meet your specialist requirements for precise temperature control, humidity and energy efficiency, among others. If your manufacturing processes require a specialised chilled environment, Bradley Refrigeration has the expertise to deliver it. Our systems can include a wide range of equipment from high quality manufacturers you know and trust. Your commercial refrigeration system can be supported by a cost-effective maintenance plan that enhances the reliability and lifespan of your equipment. Downtime is kept to a minimum by our 24-hour engineer call-out service. Would you like to know more about how we can meet your commercial refrigeration needs, anywhere in the UK? Talk to our team in Sheffield on 0114 236 9971, or email us for a free survey and estimate.